We made it to North Carolina yesterday. My parents live in the mountains so it was an adventure to get here. We flew into Atlanta and rented a car and then drove 2 hours. Other than Andi having an explosive diaper on the plane everything was super easy. Andi is becoming such a good little traveler. We are so happy to be here in the cooler weather. All the leaves are changing and it is so pretty. I changed into this sweater yesterday for our first day here. I really love this color. I live in sweaters and boots. love the color of that sweater with your hair! Love your look! 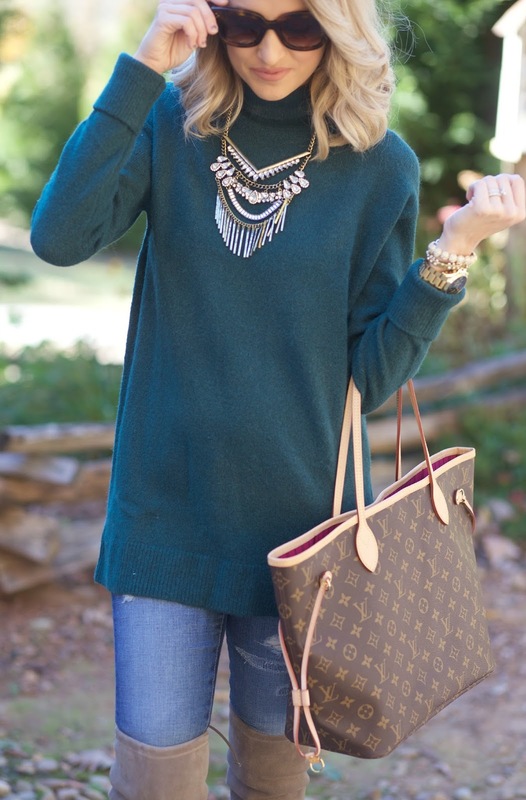 Perfect for fall days! Its a great time to be in the NC mountains! I am headed that way this weekend too!! The color of your sweater is beautiful! How lovely to be in North Carolina enjoying the cooler weather :) I hope you have a great time with your family! Omg, I love this outfit!! Looks beautiful! You have been rocking those boots lately!! Love it! Where in NC are you guys visiting?